Today the fermentation in Japan is controlled by health regulations and a cultural desire for control. The starter culture is a certified bacterial culture of Bacillus natto a variant of Bacillus subtilis. Natto is another food of strong preferential variation ranging from loathing through a neutral appreciation to the avid natto lover, very similar to the enjoyment or otherwise of fermented fish products or fermented cheeses. It is most often sold in small bundled packs of typically three packets, approximately 40 to 50 gm, each packet being enough for a single addition to a natto included dish. There are many traditional and contemporary recipes using natto as an ingredient. The making of natto is very straight forward but requires an almost fastidious aseptic technique with everything that comes into contact with the beans after boiling and the initial culture product only being handled with sterile implements and dishes etc. Slap dash technique is likely to result in failures with wild bacterial strains being introduced into the soybeans and killing the Bacillus natto strain. 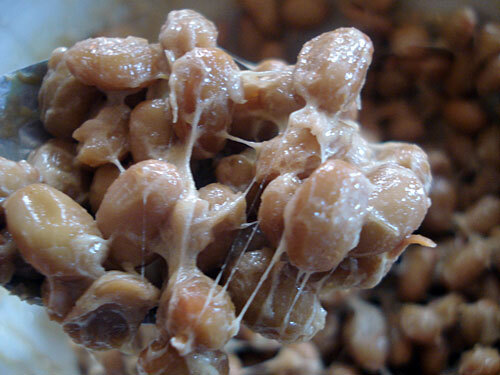 Natto anecdotally has been described as having anti-cancer properties; reversing the amyloid deposits in Alzheimer's; as a preventative measure in thrombotic disease and for dissolving the clots in thrombosis by activating the firinolytic mechanisms. It may have statin properties to reduce cholesterol levels. These proposals are either done by in vitro experiments or by association but not by direct definitive clinical trials. Until and if trials are performed, the answers are still a hope away. ¼ cup of small soy beans. 4 cups of boiled cooled water. Wash the soybeans under cold running water with agitation to completely rinse the beans. Cover the beans with 1 cup of water in a clean bowl. Soak the beans overnight covered. Transfer the beans to a piece of muslin or cheesecloth or a traditional Thai/Lao rice steamer for three hours to cook and begin the starch hydrolysis. It is most important from this point to use sterilised equipment. (Most easily effected by boiling in water for a couple of minutes). Into a sterilised open dish transfer the beans as a shallow layer into the dish. Take about 100 ml of purified sterilized water in a clean glass or measuring jug. Add a few natto beans from the commercial packet of the Natto beans. Pour this starter culture with the added natto beans over your layer of cooked soybeans. Cover this tray with a layer of plastic cling type film making sure that it doesn't come into contact with any other surface. Puncture the film with a clean toothpick or sterile skewer about twenty times evenly over the film. Press the external side of the plastic film lightly (but don't press) onto the layer of beans. The next phase is the fermentation phase which must be performed at between 30ºC and 40ºC. Use a hot water bottle placed nearby and cover it with a blanket. Place in a polystyrene box just large enough to hold the tray while it is laid flat. Place an aquarium heater adjusted to the right temperature in a water bath at the bottom of the box. The tray of soybeans should be placed a few centimetres above the water surface. Cover with the lid. In all situations it is most important to be able to check the temperature with a thermometer and make corrections as needed. If using an electric heating method make sure to switch off the power to the heater or blanket while accessing the incubating beans. Allow to ferment for 20 hours. Lift the plastic film layer and you will notice the white filaments throughout the layer of beans. This then is your natto. It won't be sticky like the commercial product but still true natto. The stickiness develops on storage. Store the natto in a well sealed container refrigerated. If you want the stringy aspect to appear then you need to refrigerate the beans for up to one week. This is not necessary for the flavour but purely the characteristic. The natto thus produced can now be used as your culture for further productions. It's very similar to having a perpetual yoghurt culture.